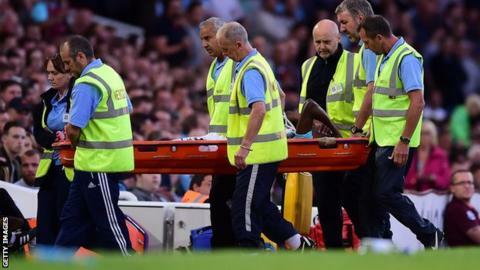 West Ham striker Enner Valencia is expected to be out for up to 12 weeks with a leg injury. The Ecuador international damaged his right fibula after scoring in last week's 2-2 draw against Astra Giurgiu in Europa League qualifying. The Hammers hope the 25-year-old will not need surgery, but he will spend the next three weeks in a protective boot. Valencia scored four goals in 32 Premier League games last season, his debut campaign for the Upton Park side. "We will know for sure whether or not Enner will need an operation next week, but if everything goes to plan we hope that he will be available for selection again within 10 to 12 weeks," said Hammers head of medical and sports science Stijn Vandenbroucke. In an Instagram update, posted before the news was confirmed, Valencia said: "I would like to thank everyone for the support and the affection shown on this difficult moment. "Thank God, today I received great news as I won't need surgery, all the best!" West Ham co-chairman David Gold has said the club are looking to make a signing to cover Valencia's absence, with Atletico Madrid's Raul Jimenez a reported target. Slaven Bilic's side play the second leg of their Europa League third qualifying round tie with Astra Giurgiu on Thursday.